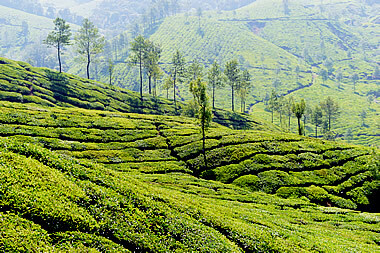 India: Munnar, Western Ghats & Tea Plantations. 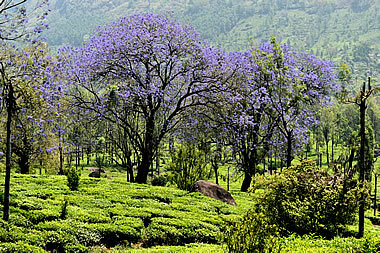 Beautiful tea plantations in the Western Ghats, especially with the purple flowering jacaranda, more good food and a bit of colonial history. 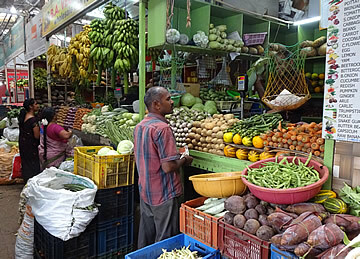 I was surprised to see masses of black and white grapes for sale among the melons, pineapples, citrus fruits, etc. 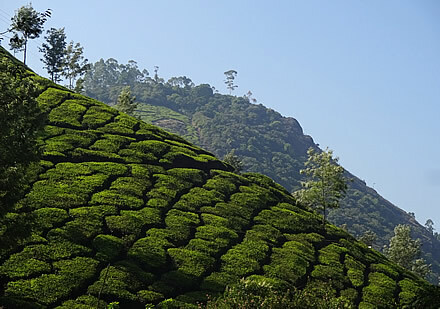 We left Kochi after breakfast for the long drive to Munnar in the Western Ghats - it took an hour to clear the Kochi suburban area but almost all the way we passed through large, busy towns. 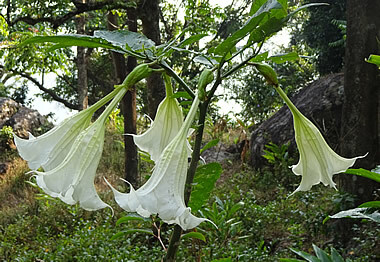 The vegetation on the drive was very tropical, passing through teak and rubber plantations, pineapple and coconut palms, expanses of tapioca bushes. 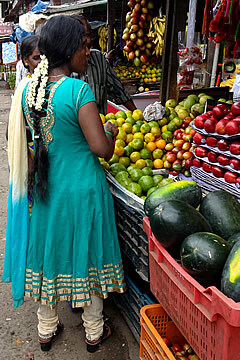 Along the roadside fresh pineapple, jack fruit, tender coconut, bananas etc. were being sold. 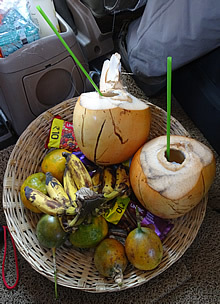 Our driver Das provided a basketful of snacks to keep us going: biscuits, peanut brittle, oranges bought from a roadside vendor and tiny bananas from a shop. 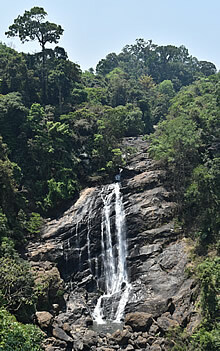 We broke the journey at Valara Waterfalls at Irumbi Palan where we had freshly squeezed lime and lemon juice with soda - very refreshing. The Falls weren't at their most impressive! 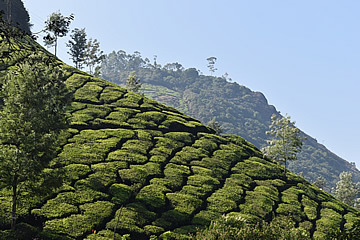 We arrived at Windermere Estate just after 1:30, the last part of the drive being through very picturesque tea plantations in a rocky landscape. It was much cooler here than in Kochi, thankfully. We'd climbed around 1500m into the Western Ghats, the mountain range which stretches from north of Mumbai to the southernmost tip of India. 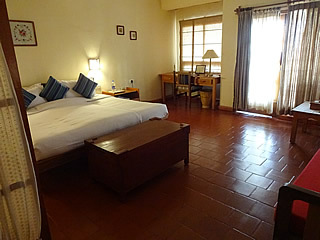 Our room at Windermere Estate. 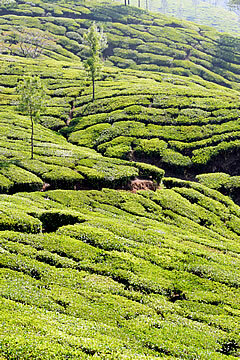 Windermere is an old plantation estate - tea and cardamom - with only 18 rooms in low buildings at a little distance from the original planter's bungalow, where the owner lives. 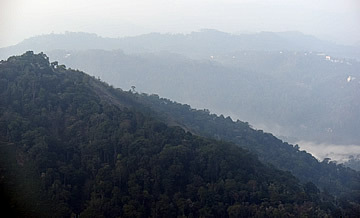 Misty view from the lookout at Windermere after a rainstorm. Part of the view from our room, early morning. The effect was only slightly marred by a building which was going up just in front of the Windermere bungalows, lower down the slope, but we were high enough to be able to look over it. Tea and coffee and sweet or savoury snacks are served every afternoon in the open-sided gazebo - that first afternoon we sampled the estate coffee, which was very good, and had deep-fried banana dough balls flavoured with cardamom. 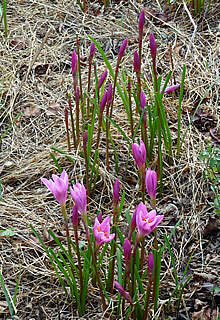 We were told this was turmeric but I don't think it is - maybe I misunderstood, looks very like crocus but surely not saffron either. 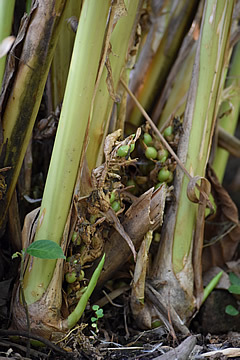 We went on the evening cardamom plantation walk with a humorous and knowledgeable guide. 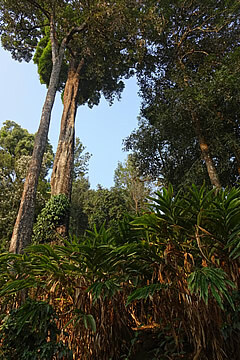 Cardamom plants need shade and water so the walk was beneath many beautiful tall trees - it is illegal to cut them down. 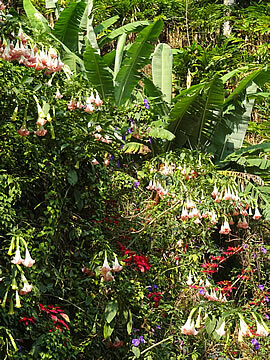 This is a very fertile spot and we were shown many different plants including almond, nutmeg, chestnut, coffee and turmeric as well as beautiful flowering plants. 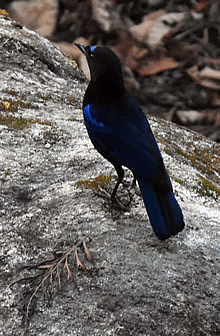 A beautiful Malabar Whistling Thrush. We heard a lot of birds including mynahs, bulbuls and the lovely Malabar Whistling Thrush which became a favourite - reminded me of summer evening blackbirds singing in the garden. Wild bee honeycombs suspended high above the forest floor. 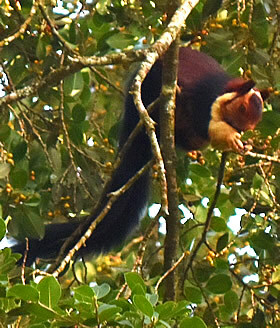 We saw, high in a tree, a Malabar Giant Squirrel with an enormously long bushy tail. Its fur is banded deep red and black with a paler face and neck. Our guide showed us a clump of long black and white porcupine quills and a pile of civet droppings (anyone for civet coffee?). 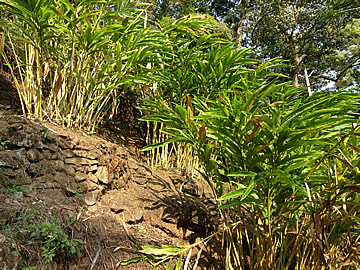 The cardamom plants sit on man-made terraces. 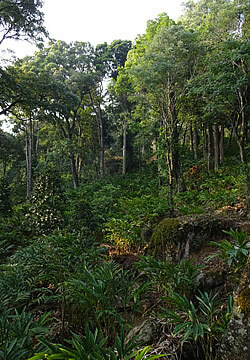 The side of the hill is terraced and quite densely planted with cardamom, always beneath trees. 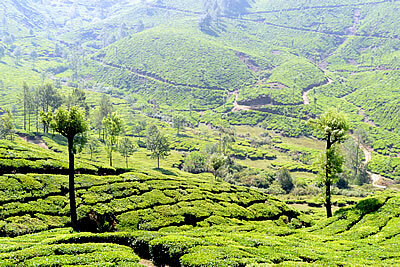 From the top of a rocky outcrop we had wide views over the tea plantations. 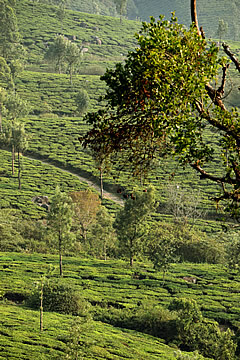 Typical cardamom plantation landscape - the tall trees are densely underplanted with cardamom plants. 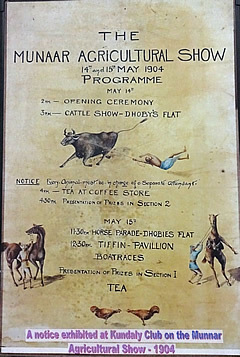 One evening before dinner we had a cookery demonstration in the gazebo - it was well-attended by hotel guests but not many had a very good idea of punctuality - the poor chef had to start his explanations four times for latecomers! The small bowls contain all of the ingredients for the battered deep fried vegetables; the batter is flavoured with Kashmiri chilli, coriander, turmeric and Garam Masala. Ditto for the fish curry including mustard, coconut, ginger, garlic, lime, red chilli, turmeric, Malabar tamarind, coriander and fenugreek. 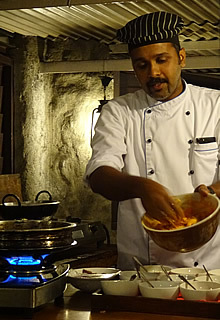 He made deep fried vegetables and Kerala fish curry, all very good. 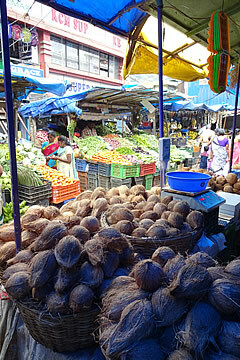 Coconut oil is used a lot in Kerala. Windermere very kindly emailed the recipes. 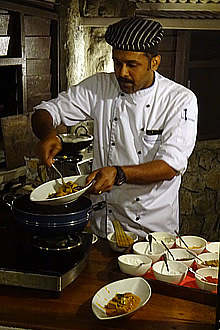 The curry leaves in the fish curry were tender and edible, unlike the ones in dishes in Kochi which were tough. We had very good food at Windermere. 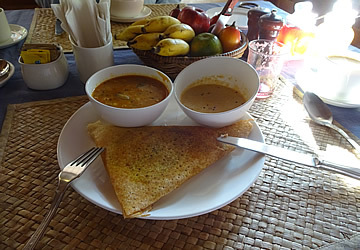 I tried the typical Indian breakfast: a spicy sambar made with the long green fruit of the drumstick tree, which was hot and very nice, a chutney which was the consistency of cold porridge - vastly different to what we think of as chutney, and not something I was keen on. 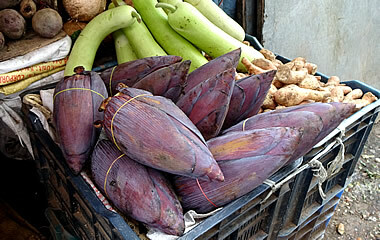 Also appam stuffed with vegetables and served hot. I enjoyed the meal but it's not a breakfast I would repeat too often. Preceded by a spicy beetroot soup, this meal included a vegetable salad, slightly vinegary fish in a spicy sauce baked in banana leaves (excellent! 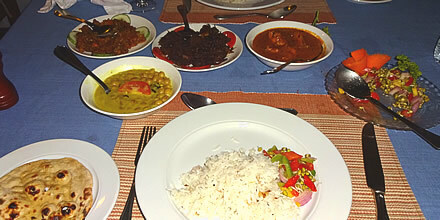 ), green peas masala, deep fried okra, mutton curry, paratha, and rice, followed by bread and butter pudding! Dinners were vast and delicious, always three courses and a range of different dishes each evening, soup to begin and a European style dessert to finish. We discovered we're not fond of paneer - a cottage cheese which is used in chunks in curried dishes instead of meat. The best meal was on our final evening: a peppery leek and potato soup followed by, as usual, several dishes for the main course: fried beef and coconut (the only time we had beef in Kerala), a bean sprout salad, a local dish of beans which I didn't care for, and a dish of roast vegetables in a spicy sauce and a terrific chicken tikka masala - we had extra servings of both these two. Excellent roti and rice to go with all that - no wonder I came home rather heavier than when we left! 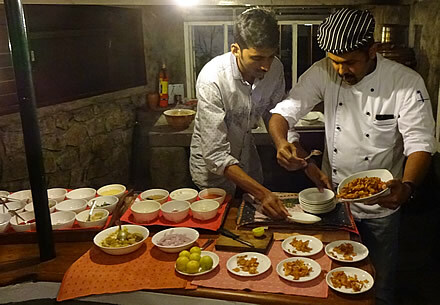 Keralan cuisine is mostly vegetarian and fish-based, though we also had pork, mutton and chicken dishes, we even had a barbecue one evening here in Windermere, with chicken and vegetables on the grill. 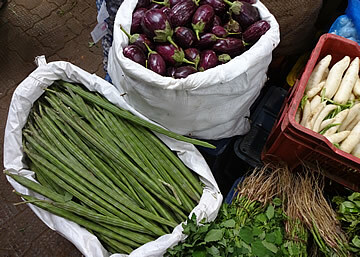 The cuisine is influenced by the many cultures which have traded and settled in the area. 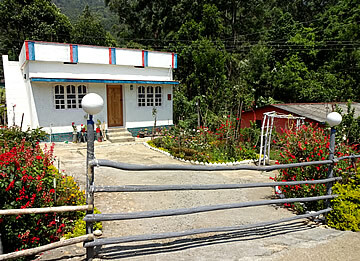 There were also the estate coffee or a range of very good teas including cardamom and ginger. 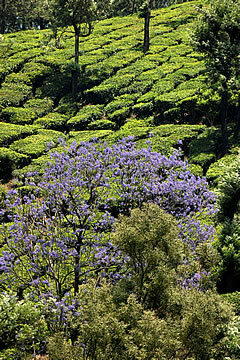 The town of Munnar is only a short drive from Windermere passing through lovely tea plantations. 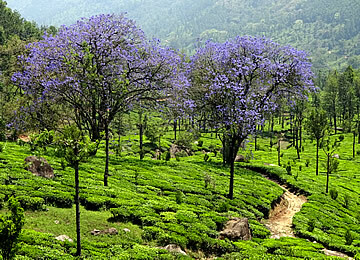 In fact Munnar is the centre of Kerala's tea plantations which, along with the mountains, makes for a beautiful surrounding landscape. The climate is cool at this height of 1500m and the Scottish planters who first came here would have been quite comfortable. 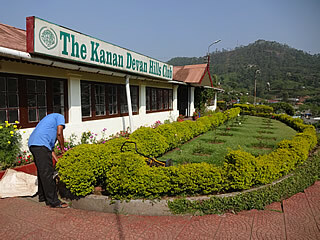 We spent a morning exploring Munnar and the surrounding area including a visit to the Kanan Devan Hills Club which was a British club for the second tier employees - the top class club was the High Range. 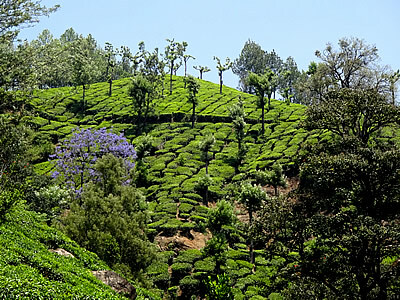 The Kanan Hills is quite small but set in immaculate gardens, very British, with hedges, small lawns, and many flowers familiar to Brits - cornflowers, marigolds, lupins, dahlias. It has a small dance hall with a stage, a reading room, and a magnificent billiard room which was locked - looking through the small windows in the door you could see a full size billiard table and four splendid chairs. 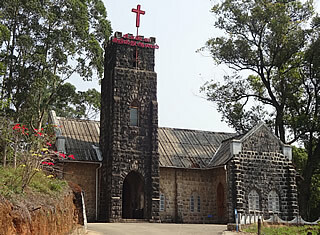 We drove on to the Protestant Christ Church, built in 1910, also standing on a hillside above the outskirts of Munnar. It is built of stone with a square tower, a classic English church. Inside are evocative memorials to the early British planters. 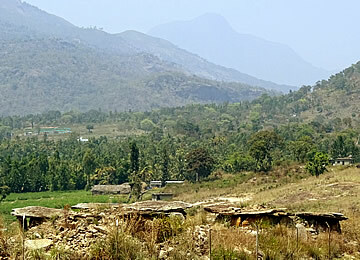 Munnar with the white mosque at the base of the hill. 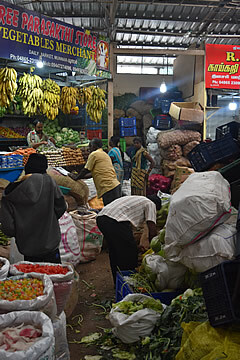 Munnar itself is a busy little town with a colourful covered market, selling wholesale as well as retail, so there were massive sacks of produce and stalls stocked out with only one kind of item - we saw one stacked floor to ceiling solely with eggs! 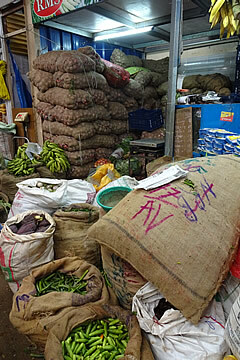 Sacks of pulses and FarFar/Papad/Fryums - flavoured snacks made from flour and starch that puff up when deep fried. 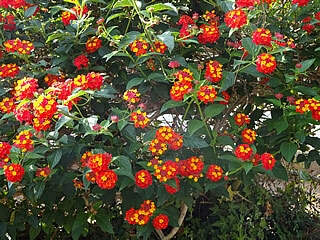 They come in many different shapes such as short tubes, stars, petals and wheels, and in a wide range of colours. 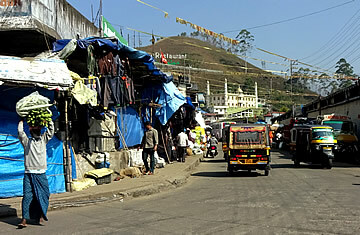 The stalls line the streets outside too, where more domestic shopping takes place. 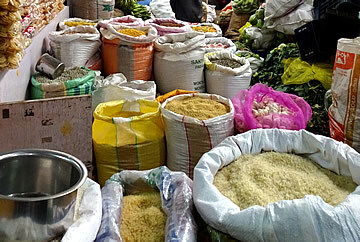 Masses of different types of rice. 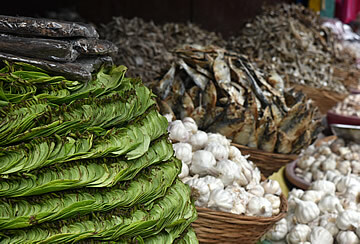 Stacked green betel leaves, garlic and dried fish. 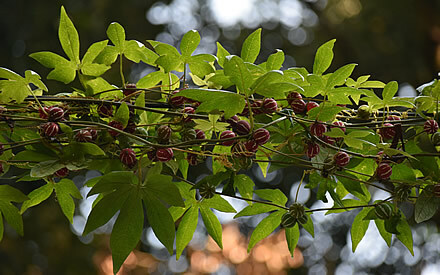 Long green fruits of the drumstick tree. 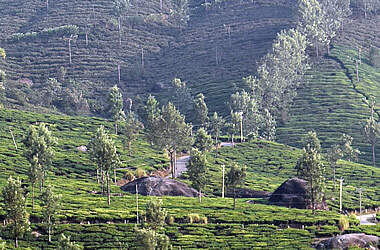 Munnar is surrounded by over 30 tea estates, including some of the highest at Top Station near the Tamil Nadu border - Kolukkumalai claims to be the highest in the world. 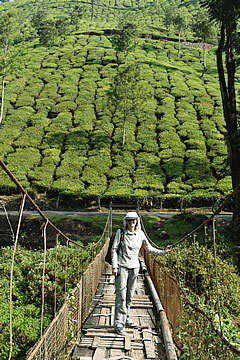 Early one morning we drove to the first established tea plantation near Margaret Bridge, built by the British in 1942. 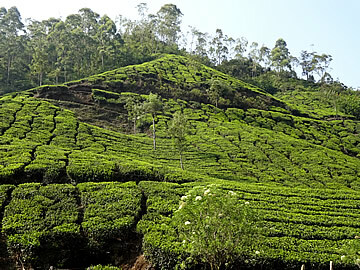 We went on to visit the tea museum - most of the tea estates were once owned by the giant Indian conglomerate Tata but were transferred to the Kannan Devan Hill Plantations Company in 2005. 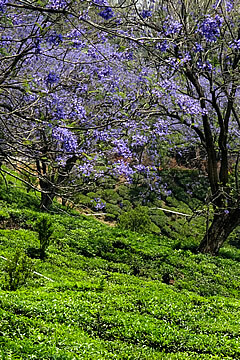 The tea museum went from being the Tata Tea Museum to the Kanan Devan Hills Plantation Company Tea Museum - rather more of a mouthful. 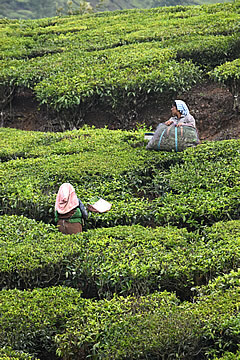 Tea has been drunk for thousands of years, prepared from the leaves of the Camellia Sinensis plant, a tropical evergreen bushy plant. 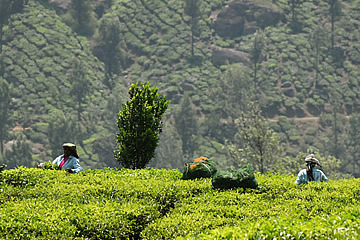 CTC tea processing in four stages or cuts. 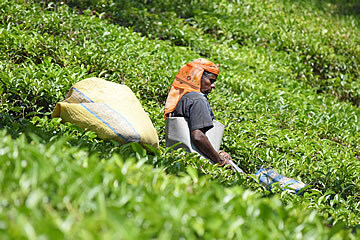 The type of tea produced depends upon the processing the leaves go through. 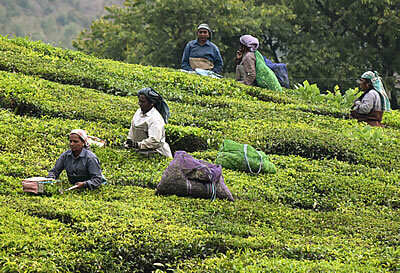 Black tea is produced by CTC (Crush, Tear & Curl) which produces granular tea which is of lower flavour, or the Orthodox method where the tea is macerated in a rolling machine, which produces a longer leafy appearance with a high flavour. 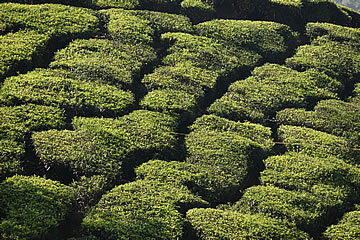 Green tea comes from the same plant as black tea but in this case the leaves are steamed, rolled and dried. 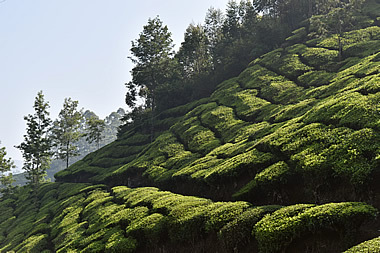 White tea is made only from the buds and smallest leaves, it is withered in sunlight and minimally processed. The tea museum has a fully functioning CTC process. 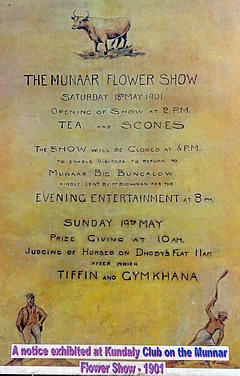 It was interesting, not only for the working tea leaf preparation line, but also for the numerous old photographs and posters evoking images of a bygone age. 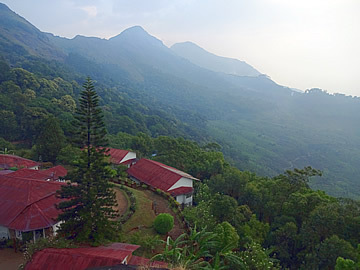 In fact the Kanan Devan Hills Produce Company was the British company which opened up plantations in the Munnar area at the end of the nineteenth century. 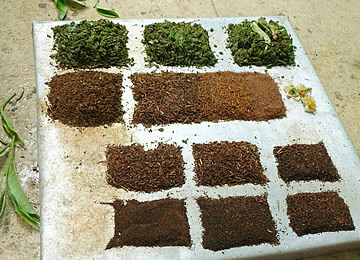 Various cuts of tea leaves and grades of tea after processing. 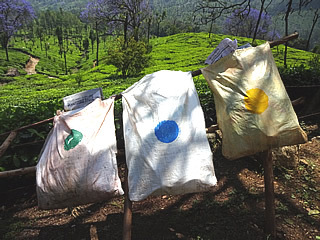 After processing the teas are graded into different sizes right down to a dust which is the weakest. 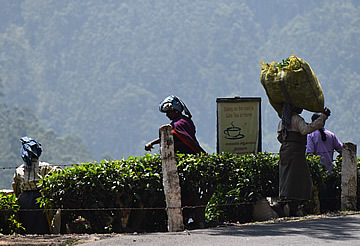 Our driver Das then drove us through the plantations to where tea was being picked, as far as we could see solely by women. 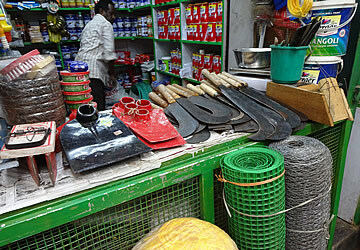 The pickers were using an implement which looks like shears with a cloth scoop attached. 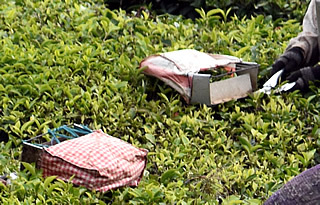 This makes picking a lot easier but produces inferior tea. 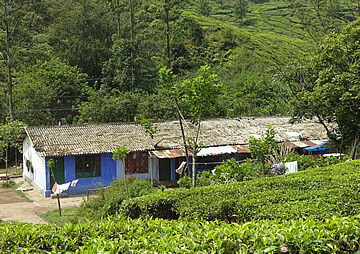 Workers' houses in the middle of the plantation. 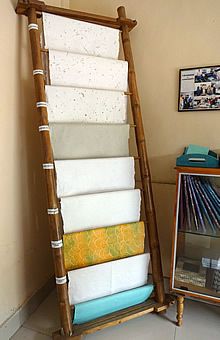 Different papers in the paper-makers showroom. We also visited the Athulya paper and cloth dying and printing factory, established by Tata and employing disabled people. 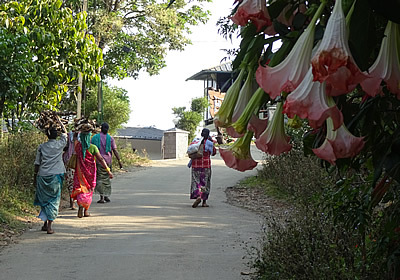 The papers are made from all kinds of things: cotton waste, tea waste, grass, leaves, flowers, elephant dung, etc. They make children's school books as well as packaging for many companies, including Starbucks. 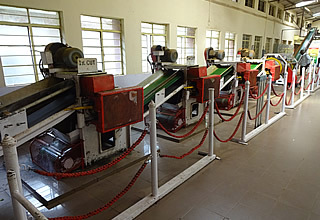 The whole process is done by hand apart from machines cutting the papers and printing lines on the school books. Printing the frontispiece, sewing the pages , etc. is all done by hand. 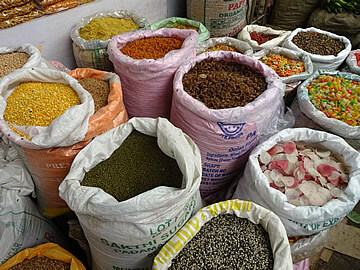 The cloth dying uses lye, a very caustic alkaline solution, and the dyes are again all derived from organic sources: tea waste, turmeric root (shades of orange), pomegranate shells (all kinds of colours from yellow to black depending on how it is used), nuts etc. The dyed cloths are printed in a number of different ways including block printing and batik which uses wax to create dye-resistant patterns. 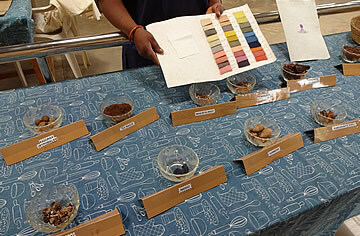 Various organic materials used for dyeing cloth and the range of colours that can be achieved. 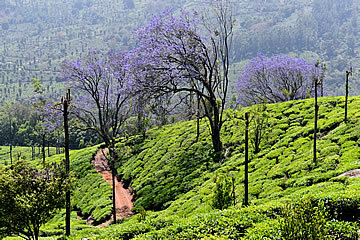 We spent a very long day exploring the Western Ghats, travelling north and east of Munnar. 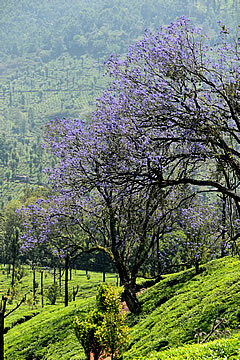 The landscape is just stunning, mile after mile of brilliant green tea plantation, and especially beautiful where the flowering jacarandas create a splash of purple. 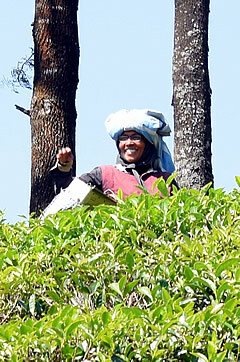 We saw women picking tea, again using shears, on the steep slopes of the plantations. 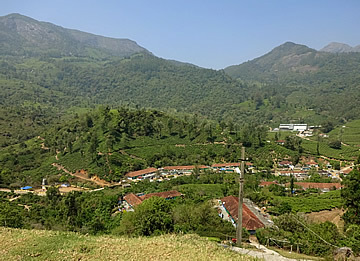 Talayar Tea Company estate with factory and workers' housing. Could almost be in England. 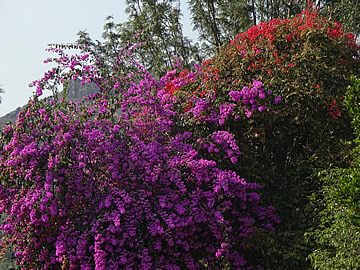 We stopped several times in the morning to walk a little and take photographs. 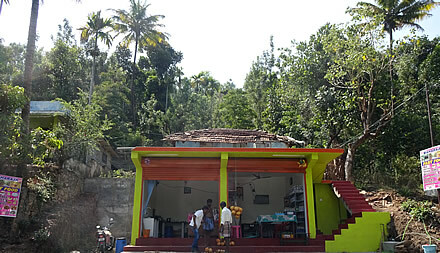 Das also stopped at an old friend's place in a village where we had lemon tea and freshly picked guava. 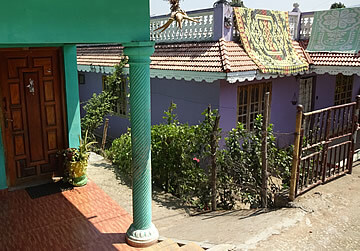 Colourful bungalows in the village where we stopped for refreshments. Some workers here were picking by hand, others with shears. 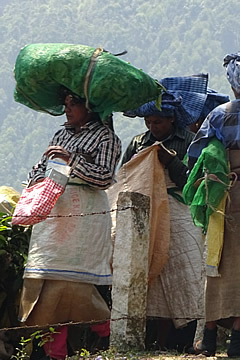 In the depths of the countryside, these are sacks for recycling. We saw containers all over this region serving the same purpose. 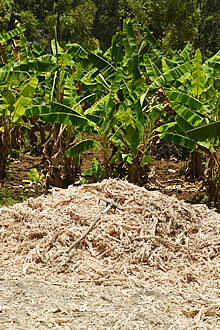 Masses of waste sugar cane lying around to dry and be used as fuel. 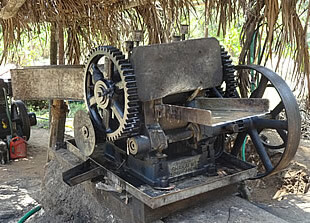 Machine for crushing sugar cane in the preparation of jaggery. We had a very interesting visit to a jaggery maker. This very sweet product is made from sugar cane which is crushed and the pulp roasted in a vast pan using the waste dry sugar cane stalks as fuel. 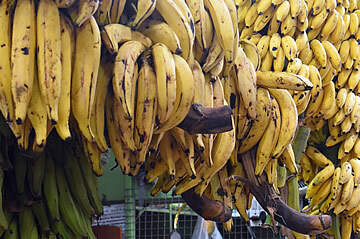 The cooked pulp is sticky golden brown granules which tastes very sweet, like treacle, and can be flavoured with ginger or cardamom. 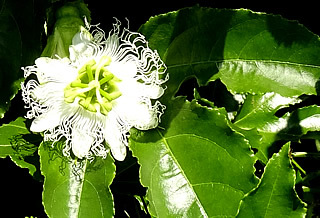 It is used as a sweetener for example in tea or coffee but also in cooking. 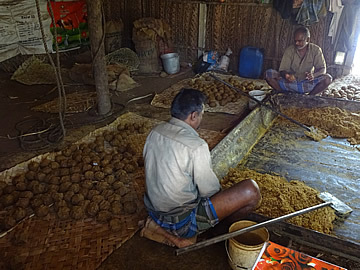 The granular jaggery that emerged from the roasting pan is formed into a sticky ball. 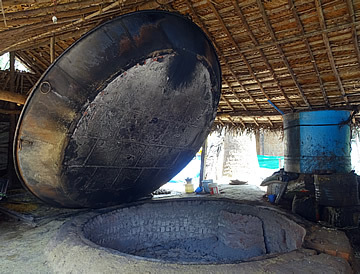 The fire pit and pan used for roasting the sugar cane pulp. 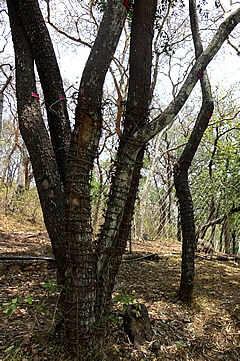 Sandalwood trees outside the fenced area protected with barbed wire. We passed by sandalwood forests, highly protected because of their value - those outside the fenced area are wrapped in barbed wire! 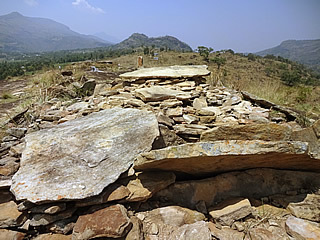 Our final visit of the day was to the megalithic dolmens of Marayoor. 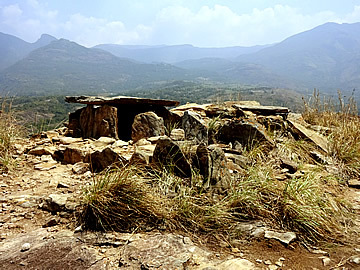 Situated around 40km from Munnar, the dolmens are spread over a wide area. The park was closed, like most parks in the region, as a response to recent fires which had killed 16 people. We spotted some dolmens a little distance off and started to hike cross country to get to them but the warden of the park ran down and chased us off! 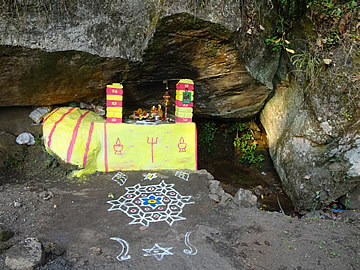 Dolmens off limits due to a recent fire. 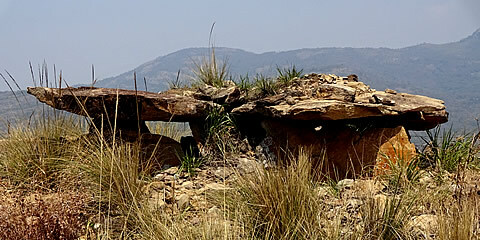 Instead we went to a high ridge not too far away which was lined with dolmens. 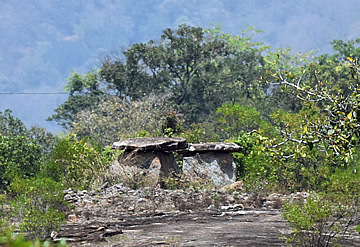 These are ancient structures, usually formed from three or more upright stones supporting a rock shelf roof. 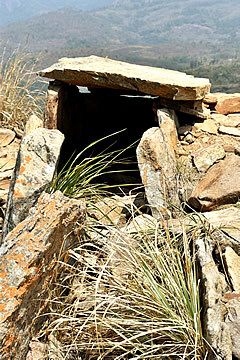 They are found all over western Europe as well, and are thought to be ancient burial places. 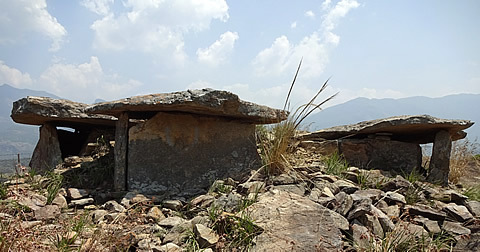 These particular dolmens are about 3,000 years old and placed high on this ridge where the surrounding views are tremendous, with a number lower down on the slopes. 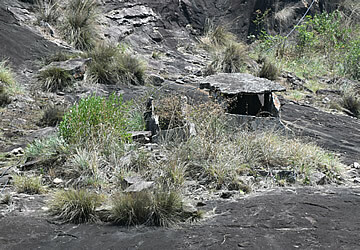 Quite a few were still in good condition, but there was also a lot of rubble around from others which had collapsed. 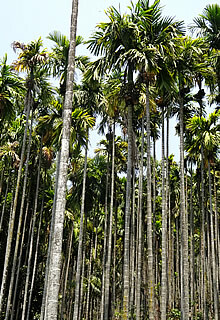 Tall betel trees seen from the car. Das kept us well-supplied with refreshments and snacks. 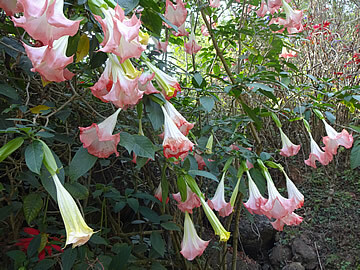 During the day we'd seen so many interesting things and wildlife including two spotted deer with enormous antlers in a fenced-off coffee plantation and a huge black eagle that flew across the road in front of the car. A very good day. 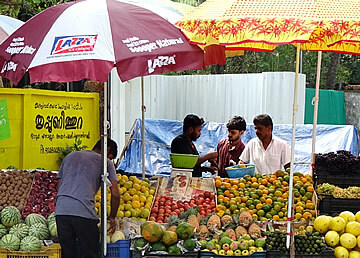 Roadside food seller where Das bought more fresh tender coconuts. 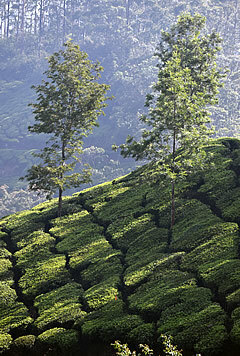 The Rough Guide to India (2003) and Footprint Handbook: Kerala were used on this trip.